Over the years the Wine Media Guild has organized many great tastings but our April event was truly historic. 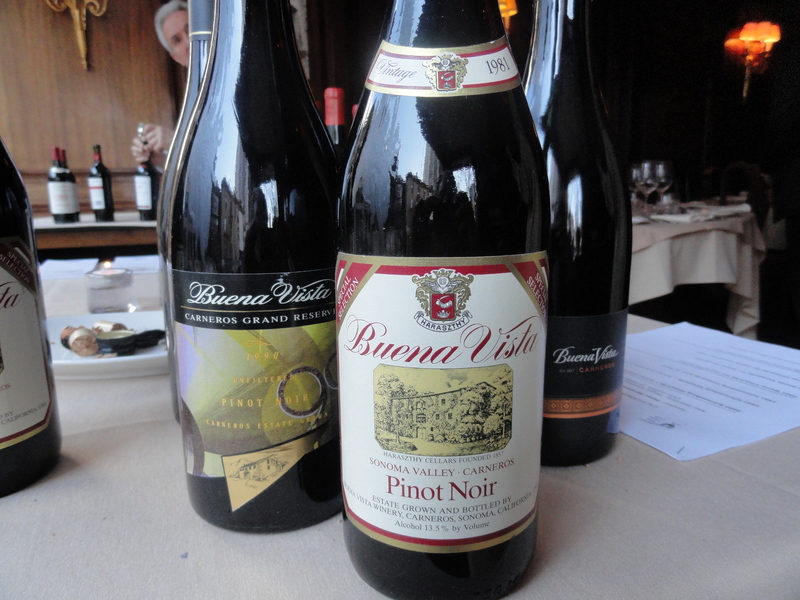 Wines from seven California wineries that were established over 100 years ago presented some of their oldest wines. 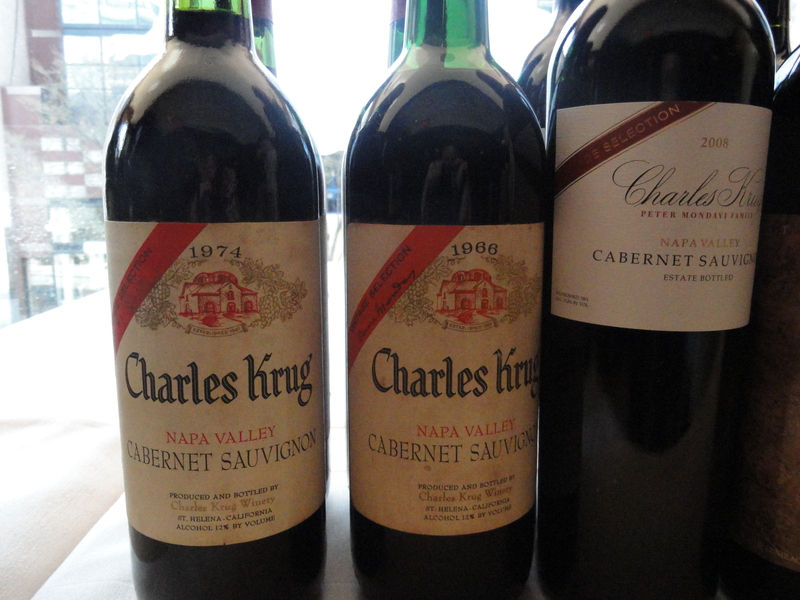 Deborah Park Wong, a Wine Media Guild member who lives in San Francisco, was the member sponsor and was able to persuade the wineries to send samples going back to1935 and from the legendary 1974 vintage among others. Unfortunately, Deborah could not attend the tasting as she was out of the country. 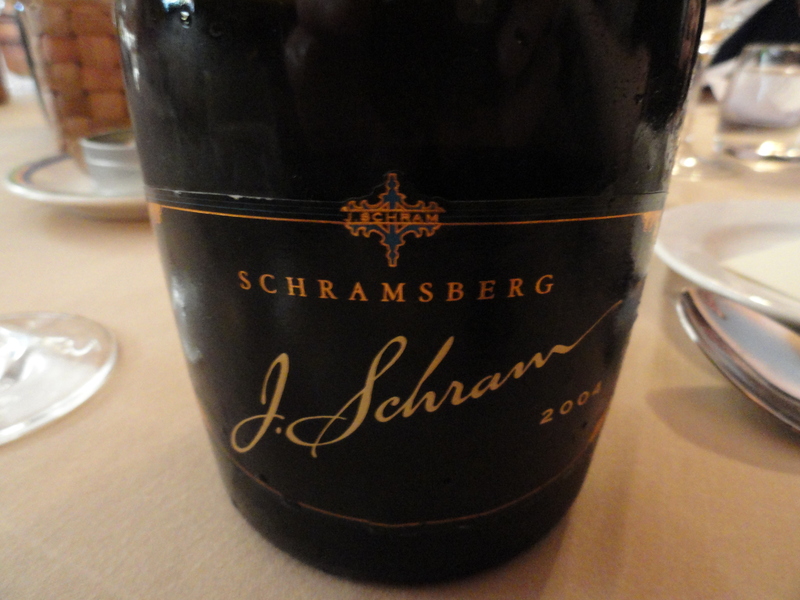 Sparkling-1981 Blanc de Blanc, 1992 J. Schram Chardonnay and Pinot Noir and the 2004 J. Schram Chardonnay and Pinot Noir which sells for $100 – All were showing very well. 1981 Sonoma Valley Carneros Pinot Noir – a great old wine with hints of leather, coffee and tea. However it did not have any Pinot Noir characteristics and blind I would have said that it was a great old Cab. 1990 Carneros Grand Riserve Pinot – this wine was just like the 1981 with a little less character. 2007 Carneros Ramal Vineyards Pinot Noir The Ramal Vineyard site has more than a dozen clones of Pinot Noir. The grapes were hand harvested from September 20-27. They were hand sorted and destemmed. Each lot was cold soaked for five days to maximize color and flavor extraction. Fermentation was in five ton open fermenters, punched down five times a day to broaden the texture and complexity of the wine. Peter Mondavi Family flagship wines- Since 1944 this vintage selection Cabernet Sauvignon has been made only in the best vintages. 1966 Vintage Selection Cabernet Sauvignon 100% Cabernet Sauvignon – there was heavy rainfall in the summer with mild temperatures. During the harvest heavy fog blanketed the Napa Valley and did not burn off until early afternoon. This resulted in cooler temperatures and the late picking of Cabernet into early November. Then record high temperatures followed at the end of the month by heavy rains. The wine was aged for 29 months in French oak 92% and American Oak 8%. The wine was bottled in September 1971. There are two things to note here: the grapes were picked in early November and the alcohol content is only 12%. 1979 George Latour Private Reserve Cabernet Sauvignon This wine was a surprise. it had the most fruit of any of the older wines at the tasting and seemed like a much younger wine. For some reason I picked up a lot of oak and vanilla that made the wine disappointing to me. 1995 It was aged in all new oak and had the taste of vanilla and oak in the finish and aftertaste. 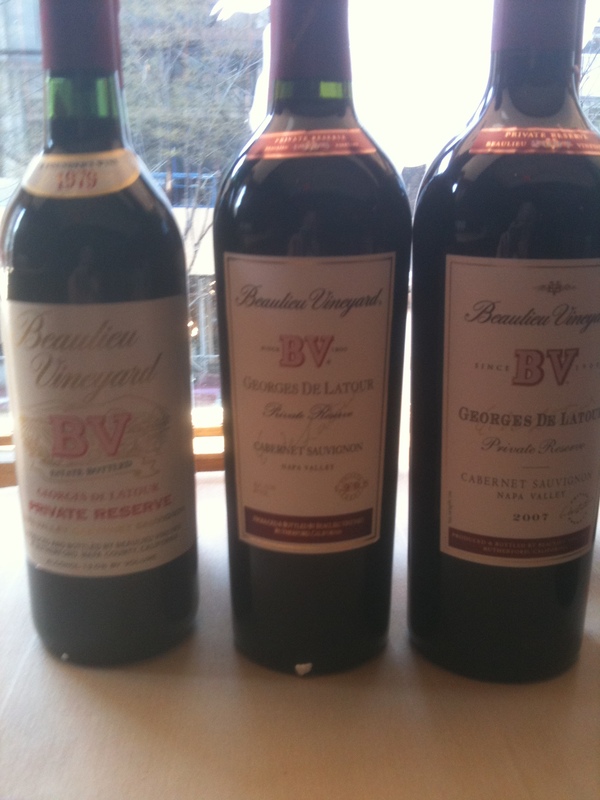 1990 This wine was brought to the tasting by one of our members and I liked it the best of the BV wines. I did not pick up the oaky flavors and found it very balanced. There was some discussion at our table which was the better vintage 1979 or 1990. I believe that the consensus was 1990. 1935 “Montepulciano” Cabernet Sauvignon I sat next to Megan Schofeld, associate winemaker at Simi so I was able to ask a lot of questions about the winery. Megan said that she did not know why the word Montepulciano was on the label. There was only one bottle of the 1935 and there were 36 people so we all just had a little taste. The wine was alive, showing signs of age but still very drinkable. The wine is 76 years old and may be the oldest wine in terms of years that I have tasted that was in such good condition. Magen said that this was the first release after Prohibition. 1974 Reserve Cabernet Sauvignon Alexander Valley– 1974 was a legendary vintage is California. 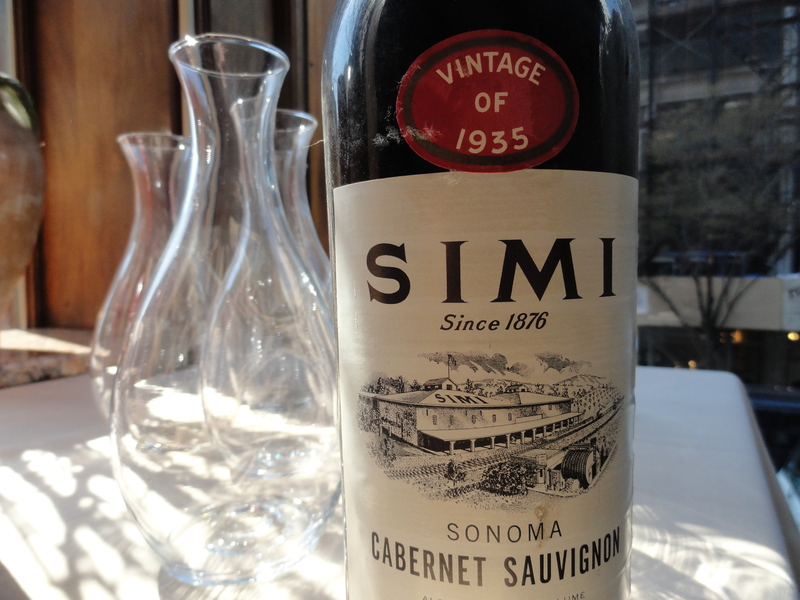 I purchased this wine in the late 1980’s and I found it then and now to be a classic California Cabernet with hints of cassis, dark fruit with the underlying aroma and flavor of bell peppers and eucalyptus. It was my favorite wine at the tasting. 1984 and 1994 both of these wines are classic California Cabernet with the same flavors and aromas as the 1974. 2004 Megan said that Sonoma County’s Alexander Valley poses the greatest diversity of soil types of any wine making region in California. There are numerous soil types and microclimate here allowing them to select from a diverse range of vineyards for their wines. Every vineyard block is kept separate throughout the wine making process and the best vineyard lots are selected for the final blend. They are blended in a small amount of classic Bordeaux varieties. 1935 Tokay– Dessert wine Megan said that she did not know what grapes were in the wine and why Tokay was written on the label. The wine was still alive and one would not think that it was 76 years old. 1982 Rhinefarm Vineyards Vintage Reserve Cabernet Sauvignon This was also showing very well with flavors and aromas of dark fruit and hints of prune. 1997 This was one of the best vintages of the decade for red wine in the Sonoma Valley. It was very fruit forward for a wine 14 years old. 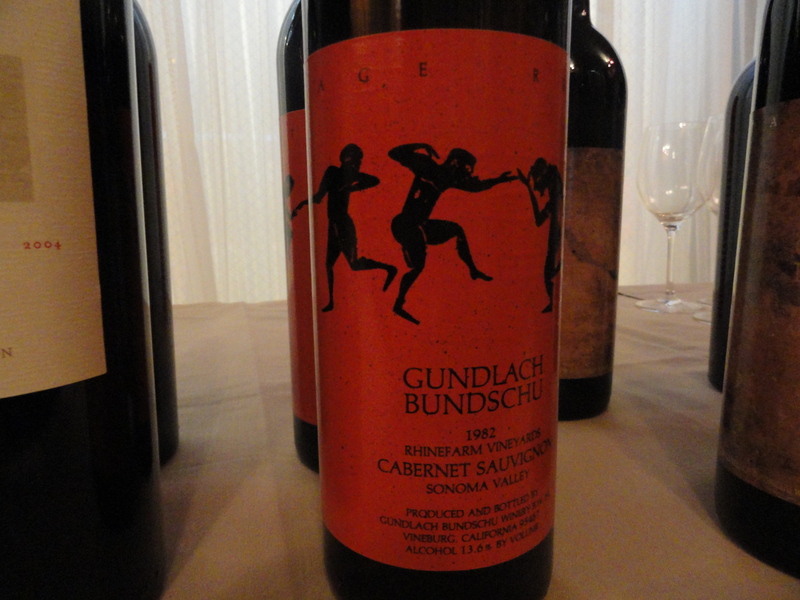 2008 Gundlach Vintage Reserve– Red Blend $40- this wine was a little too modern for my taste. Their more modern wine is made from 52% Cabernet Sauvignon, 24% Petit Verdot, 14% Cabernet Franc and 10% Malbec. It is aged in 100% French oak for 18 months, 50% ofwhich is new. The barrels are medium tight grain, and medium to medium plus toast. The primary cooper is Vicard. The speaker was Peter Mondavi of the Charles Krug winery. Peter spoke about the history of wine in California, his own winery and the difference between the older California wines and the new ones. It was noted by many of our members that the older wines were 12% in alcohol while the new ones were closer to 15%. Global Warming was mentioned but Peter prefers “Global Climate Change”. He feels that global climate change is not universal and it is only a secondary cause for the higher alcohol content. He pointed to the vines that are now being used. These vines are healthier than vines used in the past and are for the most part disease resistant. The flavor profile for the grapes has not changed but these “healthy” vines produce grapes with more sugar. The result is a higher alcohol content. The vines also produce more leaves. He also feels that today’s consumer (along with some wine writers) want a wine with riper dark rich fruit flavors and the bell pepper, herbs, eucalyptus flavors are not what they are looking for in their wine. At best he said some may like these aromas and flavors but only as subtle components in the background. The two wines I liked the best in the tasting the Charles Krug 1966 and the Simi 1974 were all leather and bell pepper with a hint of eucalyptus. He also felt that the consumer does not want to age their wine but wants to drink them now. Peter said that we would never see wines of 12% alcohol from California again. He added that he did not believe the recent wines would age as well or as long as the older wines. Chris Phelps, winemaker at Swanson and a guest of member Ed McCarthy agreed with Mr. Mondavi. Mr. Phelps remarked that the weather patterns have been strange in California over the last few years He said that today’s consumer would not like the low alcohol and subtle aromas and flavors of the older wines. 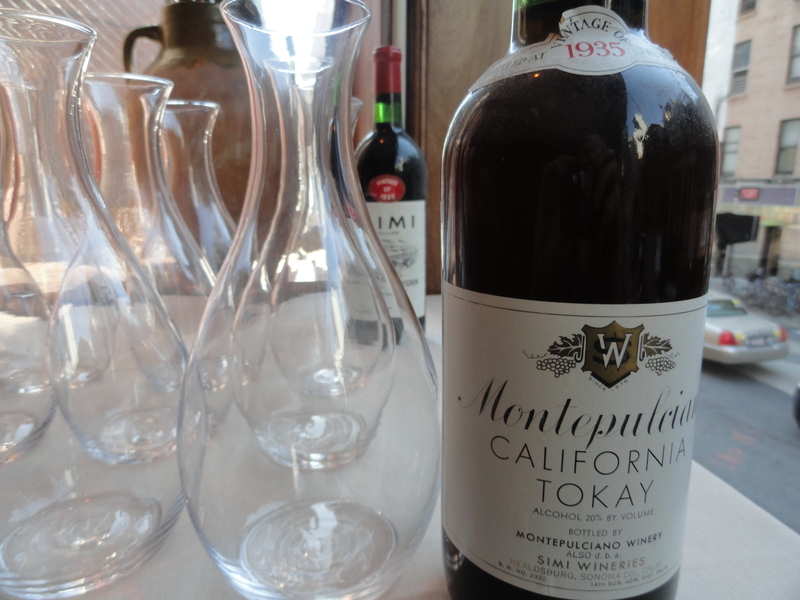 He also agreed with Mr. Mondavi that the wines made today would probably not last as long as the older wines we tasted. Most, if not all of the Wine Media Guild members preferred the older wines, with less alcohol and more subtle flavors and aromas. – the wines made today would probably not last as long as the older wines. – most, if not all Wine Media Guild members preferred the older wines, with less alcohol and more subtle flavors and aromas. It is up to the wine writers that undestand what real wine should be like to educate the consumer. Anytime the WMG is doing an event and you are in NYC you will be invited as my guest!